On 9 October 1963 at approximately 10:35pm, the combination of ‘drawing-down the reservoir’ and heavy rains triggered a landslide of about 260 million cubic metres of forest, earth, and rock, which fell into the reservoir at up to 110 km per hour (68 mph). The resulting displacement of water caused 50 million cubic metres of water to over-top the dam in a 250-metre high wave. Despite this, the dam’s structure was largely undamaged — the top metre or so of masonry was washed away, but the basic structure remained intact. The flooding in the Piave valley destroyed the villages of Longarone, Pirago, Rivalta, Villanova and Faè, killing 1,450 people and turning the land below into a flat plain of mud. Many small villages in the territory of Erto e Casso and the village of Codissago, near Castellavazzo, were largely wrecked. Estimates of the dead range from 1900 to 2500 people, and about 350 families were completely wiped away. Most of the survivors had lost their relatives, their friends, their homes and belongings. The villages near the landslide also suffered damage from the ‘air displacement’ caused by the immense “splash”. 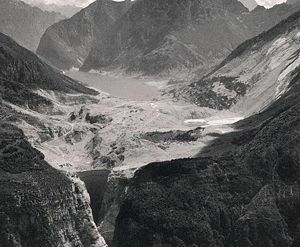 On 4 November 1960, with the level of the basin at about 190 metres of the planned 262, a landslide of about 800,000 cubic metres collapsed into the lake. SADE stopped the filling, lowered the level by about 50 metres and started to build an artificial gallery in the basin in front of Monte Toc, to keep the basin usable even when the expected further landslides divided it into two parts. In October 1961, after the completion of the gallery, SADE restarted the filling under controlled monitoring. In April and May 1962, with the basin at 215 metres, the people of Erto e Casso reported five earthquakes of ‘grade five’ on the Mercalli scale, though SADE downplayed their importance. SADE was then authorized to complete the filling up to the maximum level. In July 1962, SADE’s own engineers reported the results of model-based experiments on the effects of further landslides into the lake, which predicted a devastating disaster if they happened when the basin was full. The management ignored these results as well. In March 1963, the dam was transferred to the newly constituted public company for electricity, ENEL, but the management remained the same. In the following summer, with the basin almost completely filled, slides, shakes and movements of the ground were continuously reported by the scared population. On 15 September the entire side of the mountain moved down by 22 centimetres. On 26 September, SADE decided to slowly empty the basin down to the level of 240 metres, but in early October the collapse of the mountain looked unavoidable – one day it moved almost one metre. No warning or displacement order was ever issued to the population.